Baking season is upon us--pies, rolled out cookies and more items that might use rolling pins. As if we didn't already have enough to think about with cross-contact of foods in the kitchen, recently Karen of the food allergy blog, Avoiding Milk Protein, shared some helpful but startling news with me about the Timber Treasure brand of rolling pins that are treated with nut oils. Click the link and scroll down to see the product. I'm not an advocate of letting others bake for our allergic kids unless they deal with the exact same food allergies, or are part of that small group of family or friends that understand cross-contact, etc. Because cross contact can occur so easily in a kitchen, I think it's just safer to do the baking ourselves. Cookies and pies are about enjoyment, not about thinking "What's in this? Can it make me sick?" So not appetizing! 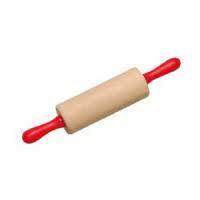 This rolling pin issue is just one more reason we have to be really careful when letting others bake for us. How many people are going to check to see if their rolling pin has been treated with nut oils? One option is to use a plastic or metal rolling pin. However, I've used a wooden rolling pin for years, without incident but it was not treated with any oil. Usually the "nicer" or gourmet cooking tools have more bells and whistles, so I always check those. I don't want everyone worrying that everything they touch contains peanut or tree nut, but the bottom line is that you have to check even the non-edible items. For more info on non-edible items that contain tree nut or peanut matter, check Karen's list, available on her web site, and if you have concerns about any of these items, check with your allergist for information on risk. Thanks to Karen for her helpful info! Jenny that's such a good point. For those of us avoiding wheat and milk the rolling pin issue is even worse! I like to use a silicone rolling pin for all of my allergen-free baking. Looking at the complete list, including otc medicines-I'm darn near speechless. Calamine lotion with peanut oil? Seriously? The stuff we use to treat allergic rashes? Thank you again for posting really helpful information. I had NO IDEA. Thank you for the link to the avoidingmilkprotein website - so much info on there that I just didn't know. I also didn't know about nuts in medicines and *laundry detergent*. I'm going to have to go double check everything. Thanks for passing this info along! Such a good reminder to me as a PA parent that there are more cross contamination issues to consider beyond the ingredient list. So many well-intentioned friends and relatives shove food at me and say "It's nut-free!" when I know very well that their entire kitchens are NOT nut-free. I feel paranoid sometimes refusing food for my daughter, but you just never know if they sliced the apple pie with the same knife they used on the walnut bread! Trick or Treating with Food Allergies? ?